Welcome to my website. I have written several books using one set of characters and am just about to publish those books. I am a founding member of a Coral Springs Writers Workshop which has been in existence for over twenty years. I have three published mystery books, a short story, and numerous newspaper articles. I know this is an oft used line, but when young I worshiped the Nancy Drew series and read each book until the pages wore out. Whenever I had a dollar saved, I ran as fast as I could to buy the latest novel. I always wanted to write mystery stories and would make up mysteries out of things that were ordinary. A label with a neighbor's name found on the ground? What dastardly criminal sent it, for what reason, and to what end? Now, I allow my imagination to find crime and criminals. I love to read, and if a book makes me laugh I continue to read the series. Hopefully, some humor finds its way into each of my books. I live in Coral Springs, Florida, with my husband and some would say crabby—perhaps referring to both my husband and dog—a Chihuahua named Watson. I prefer to think of him as a cross between Rin Tin Tin and Lassie. My Chihuahua, not my husband. My father loved the name Betty Jane and so that is who I became. In DECADENT DECEMBER we meet Kelsey Garrison. Trouble always seems to find her. Now, she's found a woman's body beneath a pier. Kelsey is a young woman with uncanny abilities. She can see ghosts, and an annoying voice resides in her head. For years she’s denied her powers and kept them secret, but the voice in her head always comes through. The most important things in the world to Kelsey are family and friends, of which she is closest to two—her roommate and her brother. Her brother's ex girlfriend, pregnant by another man, decides she wants Kelsey's brother back. Over her dead body, Kelsey thinks. But when the girlfriend is found dead and her brother is charged with the crime, Kelsey stokes her unusual insights and puts her own life on the line to prove him innocent. 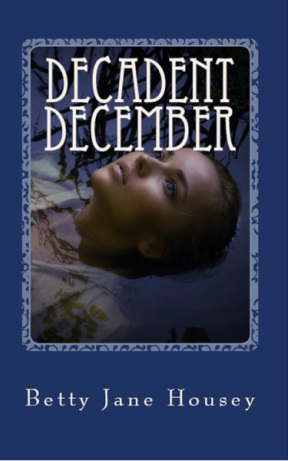 Decadent December is available at Amazon.